Of course, no number of boards would ever be enough. After his bedroom was full he began stacking them in the garage. This drew complaints from his mother, who aside from the space considerations also had questions about some of the deck graphics. Geo promised to get rid of (some of) them. 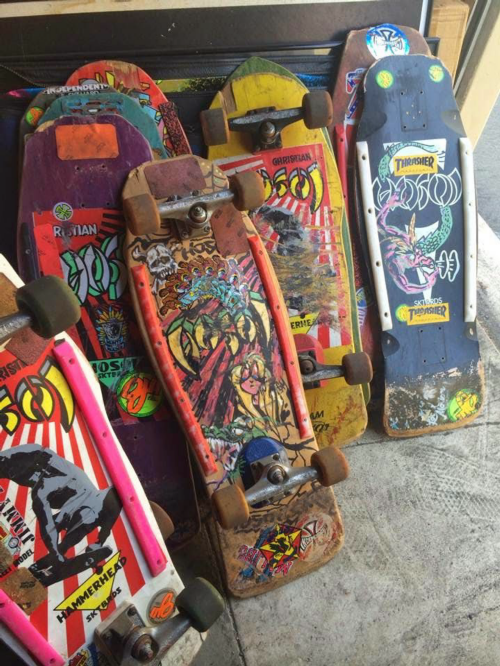 This led to his part-time business buying, selling, and trading skateboards. If anything, it only exacerbated the problem. Now he also needed a large work area where he could package up and label the boards. His mom gave up complaining when he started paying for his own food and clothes. Geo’s best customers were his friends. They had made fun of his super-hero costume, but now it had become a sort of group mascot. He devised a logo based on the costume and had it made into a rubber stamp for marking the bottom of the decks he sold. It was popular with his friends. Presently, Geo’s biggest problem was that he was getting bored with skateboarding. Not the business. The business was fine. But with skating itself. He told no one about this crisis of faith, and the profits continued to pour in. When Geo finally gave up skating it was for health reasons. His knees, his back, his hips; none of them were working as well as they used to. It made him sad, but what was he supposed to do?